Jim uses a very fine linen canvas glued to plywood and primed. This method makes a strong durable surface for painting. It eases handling outside for on site work. It is less liable to denting and cracking and is unaffected by room temperature changes. He uses ‘Artist quality’ pigments selected for their permanence and builds each painting through a sequence of layers. Jim paints on Saunders Waterford 300lb and 200lb CP / NOT watercolour papers. He prefers to have the paper stretched on to a board for ease of handling outdoors and on site painting. The pigments are ‘Artists quality’ and have been carefully chosen for their permanence. White is used sparingly as Jim’s technique is the traditional transparent method. 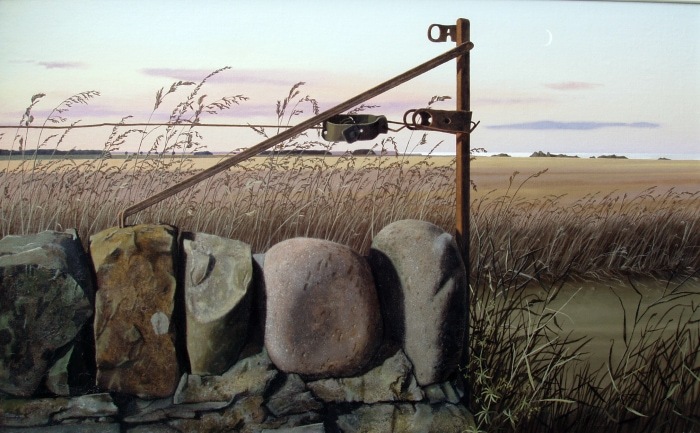 In both watercolour and oil painting, Jim always uses a reference either set-up in the studio as with a still-life or portrait or working on site in the landscape. If he requires further references for a work, he will make studies both in colour and b/w from source and refer to these back in the studio. He very rarely uses photographs. 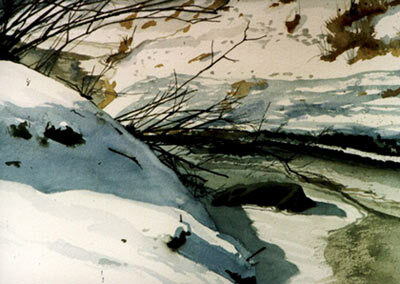 The watercolours by nature are more direct and hence take less time to produce. The oil paintings on the other hand can take up to eight weeks.Before embarking on a large oil painting, he will make many studies and compositional sketches before finally preparing a canvas. This method ensures the correct proportions and scale of the final work. Jim has been framing his own work for many years. Currently he uses natural wood mouldings that he colours to suit each individual work. Watercolour mounts, barrier papers and tapes are all acid free and of conservation standard.